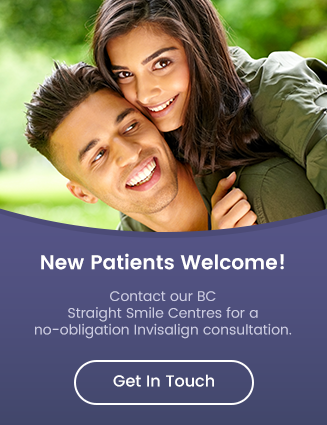 The dentists at our Straight Smile Centres in Surrey, Langley and Delta BC will be there to guide you each step of the way through the Invisalign treatment process. Your dentist will carefully evaluate your needs during your initial consultation, to determine if you're an Invisalign candidate. During this consultation, you can ask any questions you have about Invisalign, the costs involved, or anything else you're wondering about. Next, we will take pictures, x-rays, and impressions of your teeth, which will be used to create a digital 3-D image of your mouth. This 3D image will be used to develop a detailed Invisalign treatment plan, outlining the exact movements of your teeth, and the approximate duration of treatment. A series of clear Invisalign aligners will be custom made for you. During treatment, you'll wear your aligners full time, removing them only to eat, or to brush and floss your teeth. As you wear each set of aligners, your teeth will gradually begin to shift into the correct position. You'll begin the next stage of your treatment with a new set of aligners every other week. Every six weeks or so, you will have checkups with your dentist to monitor your progress. For ideal results, you should wear your aligners for 20 to 22 hours per day, throughout treatment. Soon, you'll start noticing your new smile taking shape! The day you reach the end of treatment is an exciting one – you'll be smiling from ear to ear! At your final appointment with your dentist during your Invisalign treatment process, he will prescribe retainers to keep your teeth in their correct positions after treatment. Congratulations of Your Beautiful New Smile!